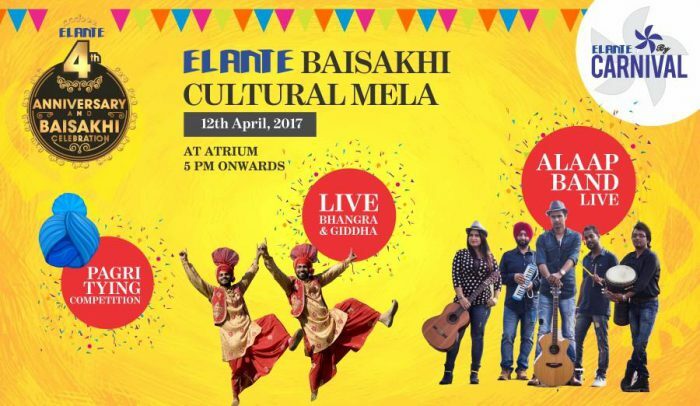 9 days long ‘Grand Anniversary Shopping Extravaganza’, celebrating four years of Elante Mall in Chandigarh and also Baisakhi festival concluded today April 13, 2017. The celebrations began on April 5, 2017. During these days shopaholics had the gala time with amazing shopping offers at big brands in Elante. The cherry on top was Hyundai i10 as the grand prize. Shopping for minimum Rs. 3000 at the mall assured attractive gifts and vouchers. On 12 April, 2017, Baisakhi celebrations were held in shudh desi style. An array of exciting events such as display of Gatka by the Virasat-e-Khalsa Amritsar Group, exhilarating bhangra and giddha performances, a soulful musical evening with Sufi rock band Alaap, flash mobs and many more fun filled activities at “Baisakhi Masti”. Enjoy the gala in pictures below!